A top trending video claimed a Marjory Stoneman Douglas student was a paid actor. In discussions of the ongoing battle over fake news, we often hear Facebook and Google criticized for playing a hand in spreading false information. And while both have made efforts recently to stem the spread of misinformation on their platforms, they've each had some major missteps. YouTube is talked about less often when it comes to fake news, though it isn't short of scandals itself. Last year, a number of companies and groups pulled their ads once it became known that they were appearing alongside extremist content and YouTube has also had to deal with predatory comments on children's videos, content falsely parading as being appropriate for kids and of course Logan Paul. But today, YouTube has stepped into the fake news spotlight. 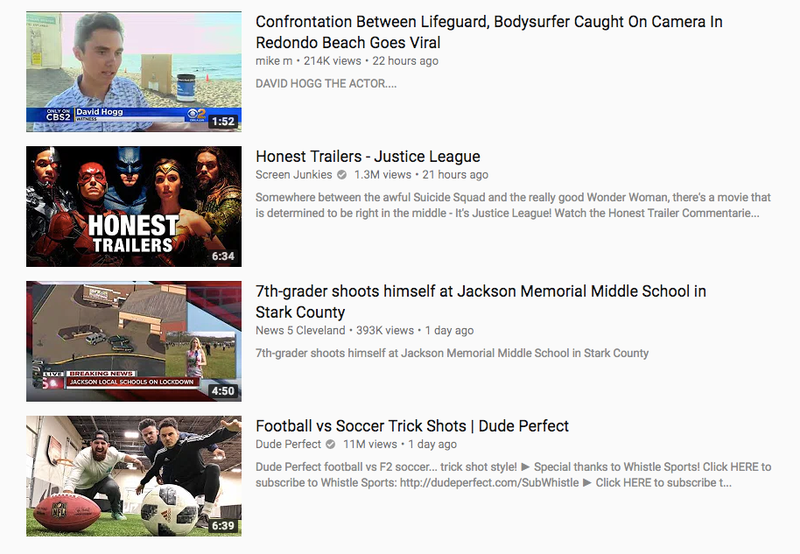 The number one trending video on the site earlier today was a video purporting to be evidence that David Hogg isn't a Marjory Stoneman Douglas High School student but instead an actor paid to speak out during crises. Hogg has been one of the many students from Marjory Stoneman Douglas High School who have chosen to voice their opinions and concerns following the massacre that took place on their campus last week. And that spotlight has attracted hoards of trolls who have made claims ranging from Hogg being coached by his ex-FBI father to him being a paid "crisis actor." The latter was the claim being made in the comments of the YouTube trending video. The video itself was a CBS News clip from last year that reported on an altercation that took place between a friend of Hogg's and a Redondo beach lifeguard. Hogg was included in the news report. Hogg, who was visiting Los Angeles during that time, published his own video about the event, but while the the CBS clip offers no evidence that Hogg is in fact a paid actor rather than a high school student, trolls have pushed it as evidence of such nonetheless. As Snopes writes, "Conspiracy theorists and trolls alike heavily implied that a months-old video (despite the facts that he readily identified himself with the same name, that people occasionally travel across the United States, and that his family moved to Florida from Los Angeles) is somehow 'proof' that he is a trained 'crisis actor,' a baseless rumor that is inevitably pushed after horrific mass shootings." YouTube has removed the video and a company spokesperson told us, "This video should never have appeared in Trending. Because the video contained footage from an authoritative news source, our system misclassified it. As soon as we became aware of the video, we removed it from Trending and from YouTube for violating our policies. We are working to improve our systems moving forward." Google, which owns YouTube, has come under fire for spreading fake news in the past. Following the 2016 US presidential election, Google search surfaced a WordPress site rife with inaccuracies about the final election numbers and after the Las Vegas shooting last October, it promoted a 4chan thread spreading misinformation about the massacre. Last year, Google took steps to prevent its search from surfacing fake news, which included adding Fact Check tags, promoting more authoritative sources and partnering with the International Fact-Checking Network. It also began to show more information on publishers, use Trust Indicators and stopped showing news from sources that don't provide their country of origin. Last month, it also announced that it would start doing more to prevent fake news from seeping into its snippets. But what's next for YouTube? Though it deleted the offending video, there are plenty more out there still claiming David Hogg is an actor -- which is also currently a problem on Facebook as well. YouTube's Trending section is curated by algorithms, not people, and as today's news failure shows, that is clearly a problem. Google has become increasingly aware that it may need more actual humans on board moderating its content and training its algorithms and it announced last year that it would hire 10,000 people to review content across its platforms. Similarly, YouTube said earlier this year that it would start manually vetting content included in its Preferred ad program following the Logan Paul scandal. But that's not enough. YouTube is a major platform with millions of viewers and when fake news makes its way into Trending, even if only for a short while, it can do irreparable damage. You can't search for David Hogg anywhere without seeing conspiracy theories making wild, unfounded claims. Today's event is just the latest issue to highlight YouTube's content problems, and it's going to have to do more than cut ad money and vet a handful of videos if it wants to not be a source of fake news and misinformation. It says it's working to improve its systems, but what those efforts may be aren't clear. Some transparency and details on what it's going to do in the future to prevent egregious blunders like today's would go a long way. Maybe Logan Paul wasn't enough to really change YouTube's culture, but hopefully a vile smear campaign of a teenager and school shooting survivor will.